GitHub - StevenJDH/Bitcoin-Markets: Monitors the Bitcoin markets with live up to the second data. Monitors the Bitcoin markets with live up to the second data. Want to be notified of new releases in StevenJDH/Bitcoin-Markets? 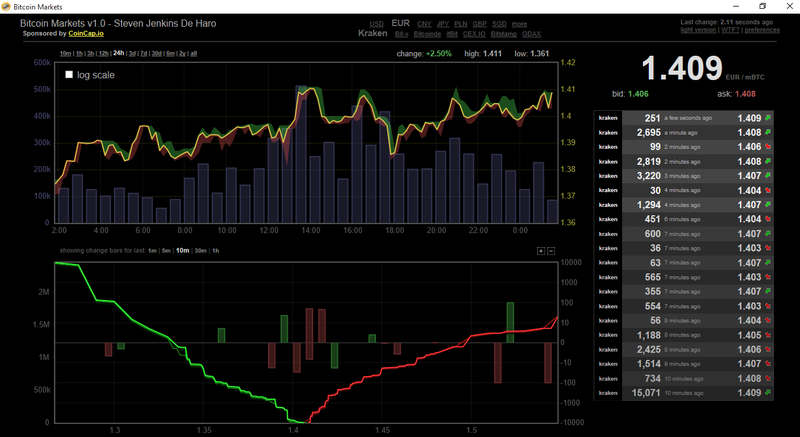 This application monitors the Bitcoin markets with live up to the second data. It accomplishes this by converting a web page from bitcoinity.org to a local application for easier use. You can change the Bitcoin units from mBTC to BTC in the top right corner under preferences. Future features are planned, so stay tuned. This is just one of many tools and applications I’ve created over the years for myself that I thought I should share with the public. I am new to GitHub so bear with me while I get adjusted. Hopefully, with community support, some of these applications will grow into something better.